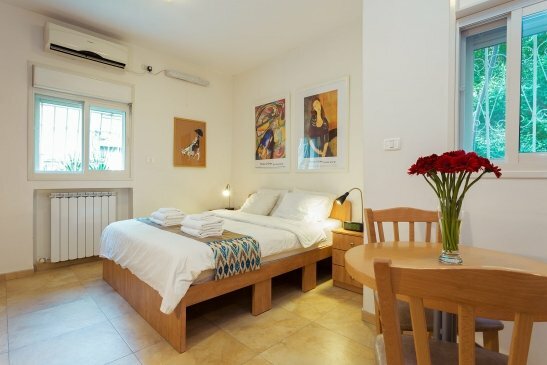 The studio apartment is all one needs for a short rent in Jerusalem, geared for single or double occupancy only. For double or single occupancy, our Studio offers an affordable experience in the vibrant German Colony. The apartment will be cleaned before your arrival, spare linens and towels are provided. After your departure, the apartment will be cleaned at no extra charge. During your stay, maid service is available. If you would like the maid to clean the apartment, change the bed linens and provide fresh towels, this service can be provided at a fee. The Studio comprises of an open space. Should one choose to dine in, the supermarket is on the next corner. The functional kitchen is equipped with sufficient utensils to prepare light meals. In addition to the microwave, there are two easy to use electric stove tops a small oven and compact fridge. Please note that the kitchen pots are kosher dairy. The table is perfect for two with an extra chair available. The suite is fitted with a closet, the beds can be made as two twin or queen size. Amenities included in the apartment are; air conditioner, WIFI, Cable TV, washing machine, safe, iron and hairdryer. My husband and I stayed in the Studio apartment in October/November 2011. It was far larger than most studios, clean, comfortably furnished and very quiet. Linda was most helpful with suggestions and addressed any inquiries we had. The owners were very attentive, attending to a minor problem in the apartment within two hours. The location is fantastic - walking distance to restaurants, shops, the Old City and other wonderful areas. The Colony Suites will be our number one choice for accomodations each time we return to Jerusalem. We have stayed at the Colony Suites many times. Our children live in Jerusalem so we go to see them often. We have had various sized apartments, ranging from studio to one bedroomed with a lounge room, and have always been happy with the accommodation. The apartments are well furnished, with a good supply of kitchen equipment, a washing machine and a parking place at an extra cost. Leeora and David are wonderful owners/managers of the apartments, always attending to any queries or problems without delay. This is the second time that I have stayed in the studio apartment for a month in the summer. The location is great, the apartment is comfortable and has all the amenities one needs ... and above all, if you have any questions or need anything, you can ask and will get an immediate response. If you want a small place in Jerusalem, I highly recommend the studio apartment to you! My family and I were pleased with this stylish, well located apartment. The host was helpful and professional. The apartment lived up to its online description. I did find that it would have been enhanced by a little more maintenance. A screen was old and ripped on one window; there was some dust under the furniture. But these are minor complaints. It was well worth the price. The neighborhood can't be beat and the apartment had charm. We couldn't of picked a better place to stay during our trip to Jerusalem. The apartment had a home feel to it. The location was perfect. It's walkable to the Old City. The neighborhood felt very safe with a bank, pharmacy, grocery store and restaurants right out the door. Even though our apartment was close to everything, it was very quiet and private. Also Linda was extremely pleasant and attentive to our needs. I look forward to staying here again. Our studio apartment was much more than adequate, with adequate closet space, great kitchenette, and private bath. The location, in the heart of the German Colony, was unbeatable, and it was great to be a few steps from home after eating at one of the many fine restaurants within a block or two. Linda, our rental agent, was cooperative and helpful, and made everything easy for us. A total win-win! And for a very affordable price!